Zeesterhuisje is een schattig openhappelijk toevluchtsoord met super comfortabel tweepersoonsbed en even comfortabele Simmons BeautyRest-slaapbank. Het heeft een goed uitgeruste keuken en gezellige open haard die u kunt genieten als de zon naar beneden gaat. Onze accommodaties zijn niet-roken. Een schoonmaakkosten van 200 dollar. 00 wordt in rekening gebracht voor elke gast als gevolg van het roken in hun huisje. This is a wonderful place in an ideal location! 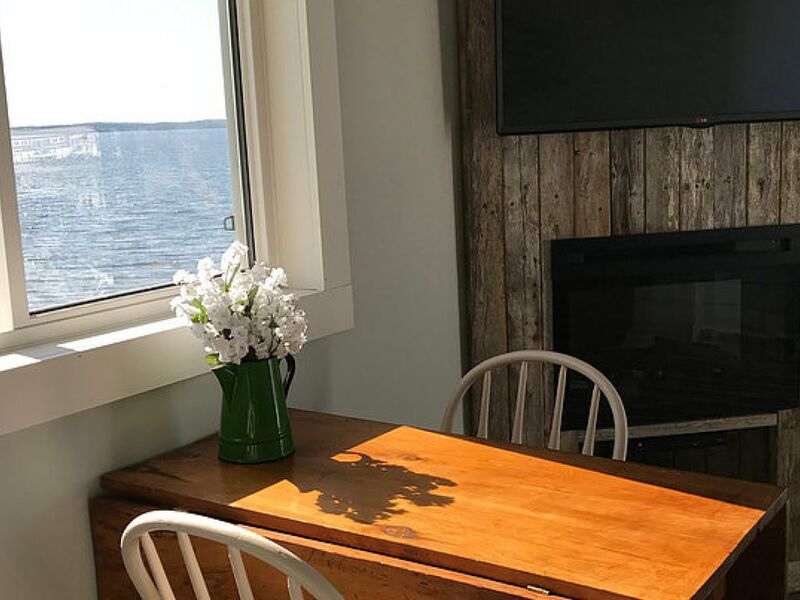 The cottage overlooks the sea, and it was great to sit on our private deck with a glass of wine and just enjoy the view. The water is tidal so you can see low and high tide in one day. One of the days we were there, we were treated to a gorgeous sunset. The cottage is nicely laid out and tastefully decorated in a casual seaside mode. The creative use of space in this small cottage made it seem much larger than it really is. The kitchen area has an apartment-sized refrigerator and a full-size stove. We were quite comfortable here. It is located only 5 minutes from Peggy's Cove, so it was just a short drive away to see the famous lighthouse. The rental was very reasonable. We would definitely stay here again if we were ever in this area. I don't know where to begin. This was not what I was expecting. The view was amazing. You will wake up to views across the ocean as far as the eye can see and crashing waves over the rocks and shores. You will observe cormorants drying their wings along large intertidal rocks. You will spend your time watching barn swallows diving for insects over the sea. An otter caught a fish and dragged it to shore one evening. Sunsets... and sunrises! The interior of the cottage, while some may find small, was gorgeous. Cozy, beachy and fresh. I felt at home. One night I shucked oysters for dinner and another evening, I cooked a mussel and salmon dinner and ate on the back deck looking at the ocean. The kitchen is fully equipped and a very convenient convience store is close by (also selling a large selection of booze!) Although, one should note that there are restaurants around that are a must try (ie Rhubard or Sou'wester). Then there were the owners. Collin and his wife were wonderful. It was my 31st birthday and little did I know my mother was trying to send me flowers. She called the resort hoping they could help her find flowers near the cottage that would deliver. Well Collin and his wife offered to pick flowers up from the florist and deliver to my sig. other (who was awake before me the day of) to deliver to me that morning. My mother as thrilled and I felt the love. People all around Peggy's cove are truly warm and wonderful. I have been out east many times (from Ontario) and I am continually surprised by the atmosphere, the people, the food and the sites. All of my Instagram pics have led to many of my friends contacting me to stay at Lighthouse Lane cottages upon their own East coast travels! What a place. Don't miss it! I will be back here without question.